When Apple's now-famous new campus opens next year, it will feature numerous parts created by the company's in-house design group and manufactured in a California factory built specifically for the project. Jony Ive and his team are responsible for the design of the new building's precast "void slabs," according to The New Yorker. Each of the more than 4,000 pieces forms the floor, ceiling, and mechanical interstitial space of the building's four stories, and will be slotted together like a large puzzle after being made in a purpose-built factory just up the highway. 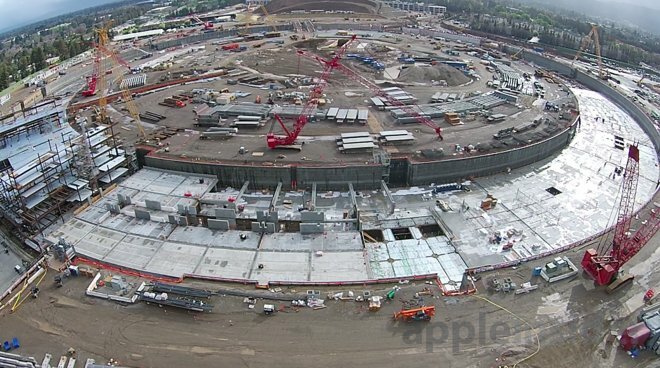 Last week, AppleInsider presented a video tour showing the first of these slabs being lined up and assembled into a foundational structure of the Spaceship Ring (below). "We're assembling rather than building," Ive said of the project. Ive has reportedly been intimately involved with the new building's details—ï¿½going so far as to prescribe a small curve where the floors meet the walls —and it's implied that he pushed famed British architect Sir Norman Foster for the job. Foster's firm is also handling the renovation and seismic retrofit of Ive's house in the tony Pacific Heights neighborhood of San Francisco. Ive praised the building's circular design, calling it "a remarkably pragmatic way of connecting the right groups," but the famous spaceship shape was not the first choice. The initial plan was "trilobal"—ï¿½something like a large Y, in which each stem is evenly spaced and of equal lengths. Apple's industrial design team has also worked with Foster's group on the building's staircases, signage, and the design of the visitor center. 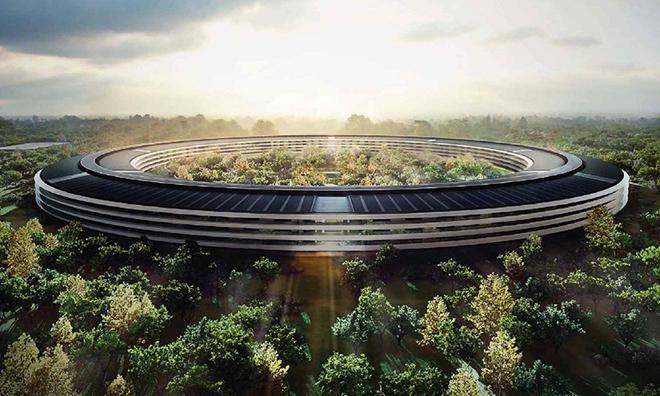 Ive seems somewhat melancholy when discussing the new building, recalling late Apple CEO Steve Jobs's contributions. "This is something that Steve cared about passionately," Ive said. "There is a bittersweetness here, because this is obviously about the future, but every time I come here it makes me think of the past as well--and just the sadness. I just wish he could have seen it." Once complete, Ive's group will occupy some 30,000 square feet on the interior portion of the building's top floor. Both the industrial design and human interface teams will share the space.